African Fabrics have exciting patterns and colors. They can be a great learning experience as well. Have you ever seen those beautiful bright multicolored scarves worn on graduation day by thousands of African Americans and African students across the United States? Those scarves are usually hand-woven, bright, and multicolored, worn to represent the membership to a Black sorority, fraternity, or to just an African student organization at the different colleges and universities. Well, those scarves are made from a material commonly known as Kente cloth, which originates from the Ashanti people of Ghana and Cote d’Ivoire. The Ashanti people used to (and still do) hand weave these bright multicolored clothes for their kings and noblemen. The tradition of Kente cloth is said to have been developed in the 17th Century, and stems from ancient Akan weaving techniques dating as far back as the 11th century AD (this is one of Africa’s textile tradition). Kente cloth is known as Nwentoma (meaning woven cloth) in Akan language, and is a type of silk, cotton, or rayon fabric made of interwoven cloth strips which is native to the Akan/Ashanti ethnic group of Southern Ghana (and also Cote d’Ivoire). It is woven on a wooden loom, which produces a band about 10 cm wide; several bands will then be sewn together to make a larger cloth. The elaborate patterns arise from the mixture of different weaving techniques applied to the same band of cloth. The quality of the fabric, and weaving indicates the rank of the person, the best being reserved for the kings. It is worn by men as a toga, and by women as upper and lower wrappers. The art of weaving Kente is passed down only to males, from generation to generation. The main center of weaving Kente is around the Kumasi region of Ghana. An Ashanti legend has it that two friends who had gone hunting in the forest came across a giant spider (the famous Ananzé) who was weaving her web. They were so amazed that they stayed welded in place for two days, contemplating the spider at work. When they returned from hunting, they imitated the animal and wove a cloth out of raffia. This is how was born the first Kente which was offered to the king. The Asantehene (king) was so amazed by the beauty of the present, that he elevated the weavers to the rank of royalty, and they became the king’s exclusive tailors. The clothes woven for the king were each unique, and whoever tried to reproduce them was severely punished. Kente is an Akan royal and sacred cloth worn only in times of extreme importance and is the cloth of kings and nobility, before finding its way into bags, and scarves sold around the globe nowadays. In Akan culture, the different colors and intricate patterns used in the weaving do have traditional meanings. Yellow: is the color of gold, and symbolizes preciousness, royalty, wealth (financial, spiritual, intellectual, etc. ), and fertility. It is associated with the earth’s generosity. This color is strongly represented in the Kente, because the king, who wears it during public gatherings, embodies all these virtues: gold, royalty, wealth, high status, glory, spiritual purity. Yellow, just like the sun’s rays, also reminds of divine goodness. Green: is the symbol of life, growth and harmony. Green reminds of the forest, the trees, birth, and youth. It is also linked to vegetation, planting, harvesting, growth, and spiritual renewal. Joined with blue and yellow on a Kente, it completes the meaning of the clothing which expresses wealth and nobility founded on humility, humanism, and balance. 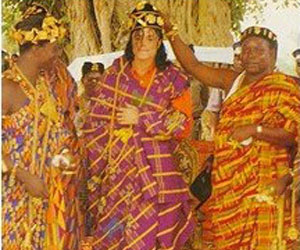 A Kente cloth was offered to Michael Jackson during his enthronement as prince of Krindjabo (Côte d’Ivoire). 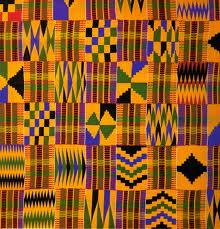 As the colors have meaning, the shapes on Kente cloth also have meanings. There are five (5) most commonly used patterns: square, triangle, diamond, circle, and cross. Square: is the symbol of the earth and cosmos, with its four sides marking the junction between these two entities. It is associated with femininity, because the woman gives life (creation – procreation). This shape is very common in the Kente as a reminder that the Akan society is matrilineal. Triangle: with its three sides, represents life and family. The base symbolizes the birth (of the world) and existence (realization of self, and one’s destiny). The summit marks both death (physical) and spiritual elevation. The three sides represent the union of masculine and feminine principles that combine to give a third principle, like the father and the mother who give birth to the child or as the intellect and the heart which give birth to will-power. The triangle in essence, simply represents completeness; it represents a man’s life. National Museum of African Art). Diamond: is two triangles upside down. 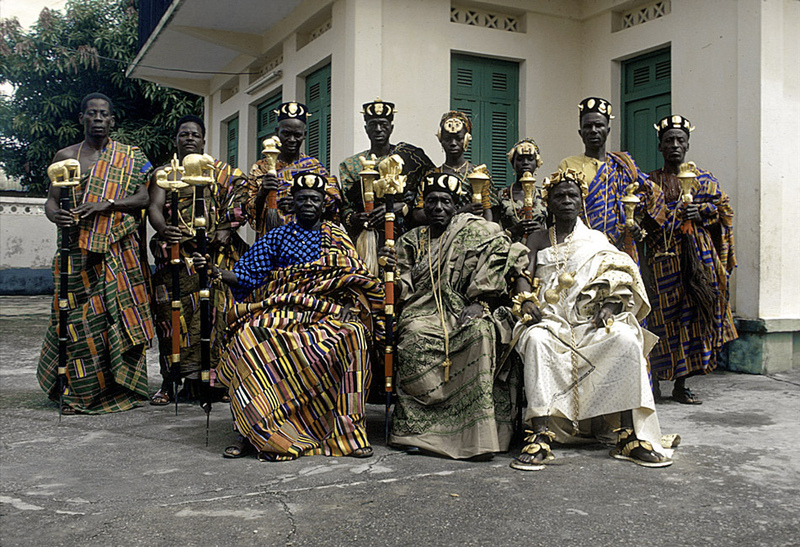 Often present on Kente worn by kings during big ceremonies, it symbolizes the existential duality of the monarch: as a chief (the bottom triangle), and as a human (the top triangle). These two are linked, meaning that both destinies as king and man are linked: all his acts as man and king, work for his prestige and that of the royal institution. Circle: represents the infinite, with neither beginning nor end. It is analogous to power as the concept of infinity, just as eternal royalty, whose origins are often lost in the midst of time. The full circle represents the universe, the community of men. This figure of divine essence is found on almost all Kente worn during the enthronement of the king to remind all of his divine character. Cross: brings back to the motion of the water and fire, but mostly to the four cardinal points. When one extends one’s arms, it symbolizes the vital force, the breath of life, and an existential landmark. The cross is found in different shapes on the Kente, but also on another Akan cloth, the Adinkra. 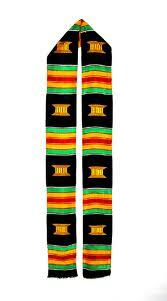 .Thus, the Kente can be read as an open book to the philosophical, political, and social concepts of the Akan society. To learn more, check out: Kente history, Wrapped in pride, Kente designs, asantemankente.com, Afroriental, and Busua Inn Above all, the Kente is the fabric of royalty, and should be adorned with great pride.